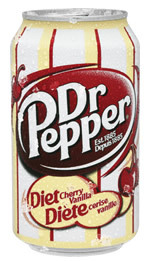 Diet Dr Pepper Cherry Vanilla is a flavor variation of Diet Dr. Pepper. How Does Diet Dr Pepper Cherry Vanilla Compare? Diet Dr Pepper Cherry Vanilla contains 3.25 mgs of caffeine per fluid ounce (10.99mg/100 ml).